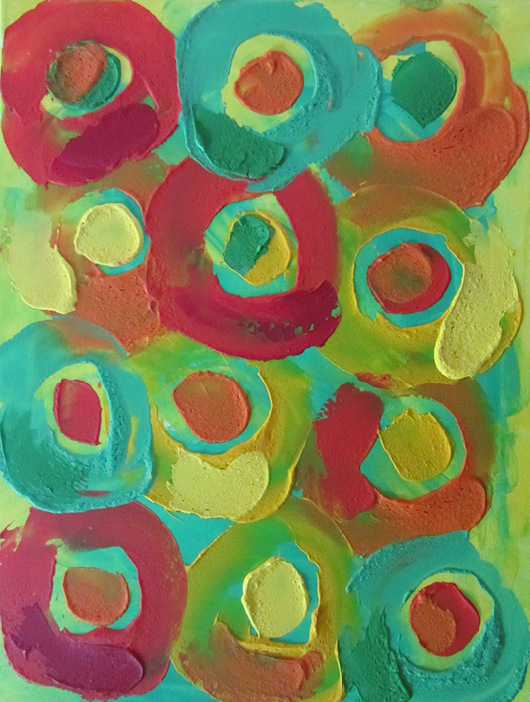 To create original abstract art I use fun painting tools that spark my creativity. I’ve made a list of some of the everyday items that inspire my painting style. These items are my starting point for bold modern abstracts. New original wall hangings just happen when I have an open mind. 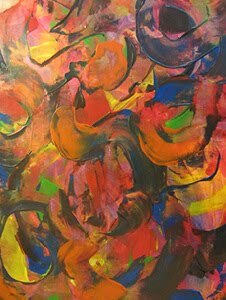 When I’m painting I just love to apply paint on stretched canvas with baking spatulas, or squeegees for big canvases to get a larger paint stroke. I mix lots of paint colors, in some of those paint colors I add flour to make the paint thicker. 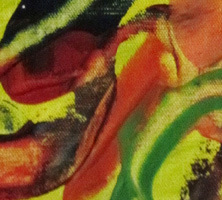 I can really build up layers in a contemporary abstract painting that way. 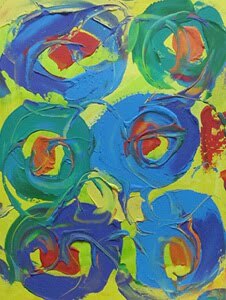 Some days I use squeeze bottles to add thick or thin lines of paint in swirls as a finishing touch on an abstract. Or instead of adding more paint I can take some away with a hairbrush, or comb which leaves a very interesting pattern. If I’m feeling really adventurous I add buttons and beads to the still wet paint as another layer of interest. 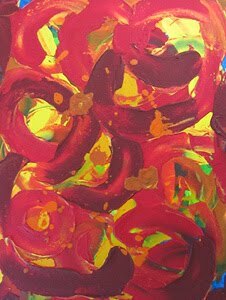 If an abstract painting doesn’t come together easily when I’m experimenting, I put it aside for awhile to work on again at a later time and that usually does the trick. 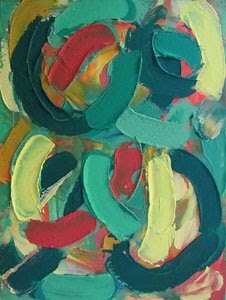 See my previous blogs on the creative process called Painting Abstract Art and Being Open to the Creative Process. 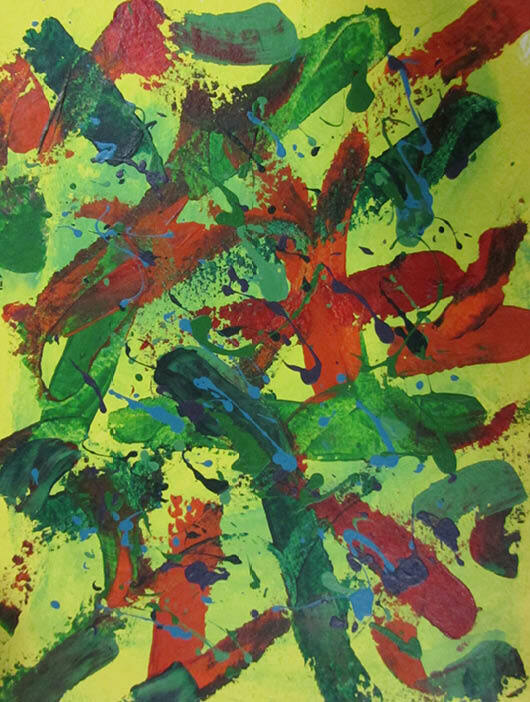 The abstract painting Koi shown above is a textured acrylic with red, green, orange and blue swirling brush strokes on a yellow background. Vibrant oranges, reds, greens and blues show Koi swimming in a garden pond. This original wall hanging measures 18" x 24". 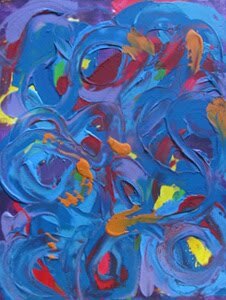 Buy original abstract paintings that vary in style and color from the art you already have, don’t buy more of the same. We’ve all done it, because we feel safe in buying what we know. The problem is you end up with multiples of virtually the same painting. 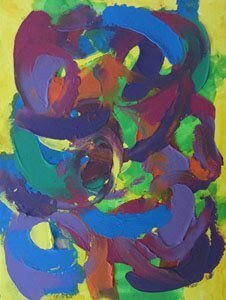 Step off the edge and plunge into the unknown world of original abstract art. 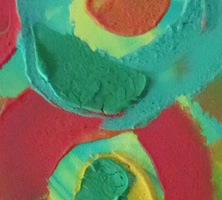 Search for artistic abstracts painted with unusual textures, commanding shapes and bold colors. When each contemporary wall hanging you buy is unique from the next in style and color you will be more satisfied with your purchases. Of course they should all look spectacular on your walls, or send them back. 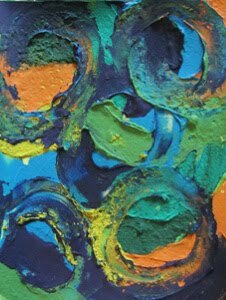 Hanging contemporary abstract paintings in your living space is about adding depth and layers of interest to your home with bold colors and textures to highlight your home’s unique features. Abstract paintings can focus attention on high a ceiling, a featured wall, or just pull everything in a room together in a striking way that makes your home’s decor style stand out. 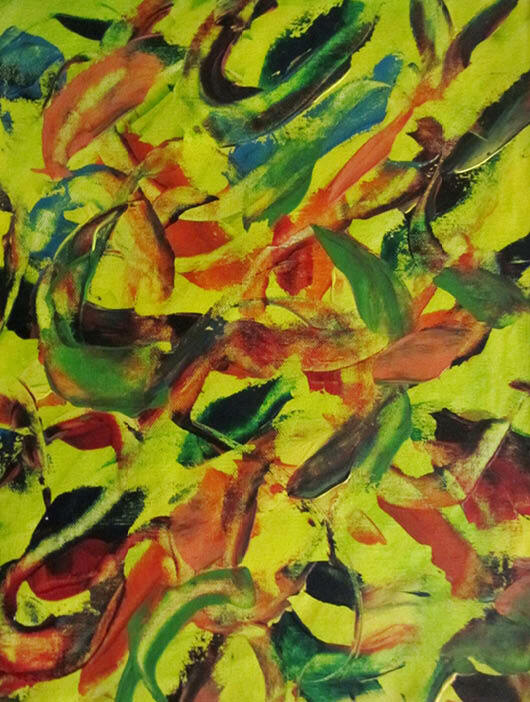 The abstract painting Fall Garden shown above is a textured acrylic with bold red, green, orange brush strokes and splatters of blue on a yellow background. The vibrant oranges and reds show Heleniums, one of my favorite flowers, blooming in the late summer sun. This original wall hanging measures 18" x 24". Hang colorful abstract art to avoid design missteps. 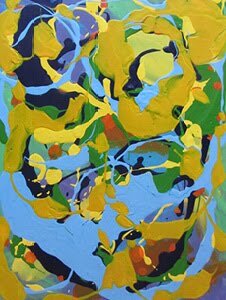 I’ve learned that hanging bold abstracts will fix a problem room and finding solutions to interior design issues made me realize I like combining many decor elements together with original artwork. I create an inviting warm space by strategically placing abstract paintings together with home accessories in a fun purposeful way. Did you ever have colors or patterns that didn’t match in the same room. It’s a fun fix when you hang a boldly painted canvas that goes with everything. Do you feel neutral colors are cramping your style. 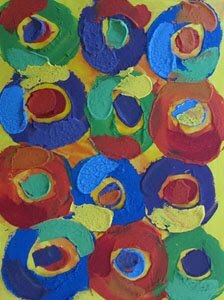 Then go with colorful modern abstracts and your home will come alive. Or not sure that your living area is ready for special occasions. Any space can be made comfortable and elegant with a contemporary abstract wall hanging as the focal point. 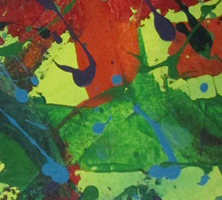 The abstract painting First Day of Kindergarten shown above is a textured acrylic with thick red, green, orange and yellow paint. Vibrant colors show happy children getting to know each other while sitting together on mats for story time. This original wall hanging measures 18" x 24".